The Energy Information Administration released final data today for 2009 domestic natural gas production (data here), and the graph above shows that production hit a new record level in 2009, breaking the previous record set in 2008. The 2.2% increase in 2009 follows increases of 4.4% in 2008, 4.8% in 2007, and 0.33% in 2006, bringing last year's production to a level 12.2% above the output in 2006. This surge in domestic natural gas production over the last three years has enabled the United States to overtake Russia as the world's No. 1 producer of natural gas, and is all due to advanced drilling methods now being used to drill for gas through a type of rock known as shale. Read more here. Interesting side story in Texas: gas producers are trying to stifle the wind energy industry. Don't forget that some of these gas technologies could, if they are not careful, affect the underground water supply. So, while its good, let's be careful. BTW, methanol can be made from natural gas. Cars can run on methanol, and it is considered safer than gasoline (that's why it was used in race cars for years). It has less energy par gallon than gasoline, but we can make plenty of it, and in the USA. CADDO PARISH, La. -- A massive natural-gas discovery here in northern Louisiana heralds a big shift in the nation's energy landscape. After an era of declining production, the U.S. is now swimming in natural gas. Even conservative estimates suggest the Louisiana discovery -- known as the Haynesville Shale, for the dense rock formation that contains the gas -- could hold some 200 trillion cubic feet of natural gas. That's the equivalent of 33 billion barrels of oil, or 18 years' worth of current U.S. oil production. Huge new fields also have been found in Texas, Arkansas and Pennsylvania. It's not *just* technology, it's a combination of technology and higher price. And you could probably add a vital, well-capitalized private oil & gas sector. The last one is not a new thing, but one without which we would not be seeing the shale breakouts we have seen. Note it is not the Exxons, Chevrons and Shells that are in the shales. It's very easy for a private company of relatively small size to access capital and get a permit to drill a well in the US and Canada. Generally, this is not the case elsewhere. We have institutions in place that allow capital and talent to flow quickly to these emerging plays, most places do not. Producers will be the losers and consumers will be the winners as prices remain exceptionally low for years. The gas companies wanted technology to improve their operations, well now they've got it. Be careful what you wish for. I agree that the big oil companies have not been leading the way on shale. But I think that's going to change. Exxon is paying $41 billion for XTO Energy. Some industry executives say they expect other majors to use their big piles of cash to move into shale. Too late for Exxon to be considered "a leader" now. Mitchell was drilling Barnett shale wells in the 1980's, and horizontals in the early 1990's. I think majors will move into the shale now because they have to. It is the future. They cant afford not to understand it. But it might have been a long time coming if we had to wait for them to get around to it. Even longer if we had some national oil company. There are gassy shales all over the world. There's a reason that we actually produce gas out of them here in the US. We have a leasing system that a) allows it and b) rewards it. I saw a chart once that showed 80+% of the oil & gas wells that have ever been drilled have been drilled in the US. This has more to do with our economic system than our geology. How exactly do gas producers manage to do that? Wind power seems to be favoured by governments, who offer massive subsidies and pass rules and laws that force utilities to buy more expensive power from producers that use wind turbines. This story shows just how shallow the so-called analysts really are. Most of the natural gas increase did not come from shale but from coal bed methane production. The problem is that CBM production is now in decline because the production was not sustainable. And if we want shale to be a viable source we need much higher prices than what we are seeing at this period of time. We also need to ensure that producers ensure that the potential environmental problems are solved. If the fracture process manages to contaminate aquifers, the courts will step in and prohibit its use. This is typical hype that is common in the industry. It is just the latest in a series of promises that never seemed to pan out. Not all that long ago we were told that we would be flooded with cheap gas as new pipelines would bring stranded Arctic gas to the market. At the same time, additional supply would come from LNG. When the expected ramped up production from coal bed methane was added to LNG and Arctic gas, the 'experts' told us that prices would stay low for decades. Well, the experts turned out to be very wrong. Not long after they assured the utilities that they were safe to go with natural gas based power generation because they would be looking at $2.50 gas until 2025 or later, prices took off because supply growth could not keep up with the increased demand. Instead of paying attention to the hype it might make sense to look at the actual production data. Sadly for the optimists, the picture on that front does not look as good as is being claimed. First we look at the actual statements made by the companies that are involved in natural gas production. From last year's Chesapeake Q2 conference call we got a good idea about the production profile for the first five years of an average Barnett Shale well. The presentation revealed that the wells have an initial production rate (production on the first day) of about 2.5 mmcf per day. After a year the decline rate takes production down by 70%. You can verify this for yourself by looking at the normalized prodcution curve graph. It was also revealed that the wells have a first year decline of 70% and an estimated ultimate recovery of approximately 2.7 bcf. This means that as a shale formation is drilled off aggressively, we will see a large addition to supply. But that addition has to be offset by new wells just to offset the natural decline. And that is where the problem comes. Although companies can justify drilling some wells because the futures markets allowed them to get a high enough price, they cannot justify drilling when prices fall below the level that allows them a reasonable return. From the Chesapeake revelations we already know that the well will have experienced a decline that takes average production to around 420 mcf per day by the fifth year. By the end of the fifth year, half of the gas that could have been recovered had been pulled out of the ground and future contributions to supply become far less meaningful. So what we have to counter Mark's naive optimism is an economic and geological argument that shows that the increase he is hyping is not sustainable. I haven't even talked about the problems that do not show up in the aggregate production figure that Mark cited. Much of the increase came from growing coal bed methane production but that story has run its course and CBM production is now in decline. Add to that declines from conventional sources and the future is much bleaker than Mark suggests. 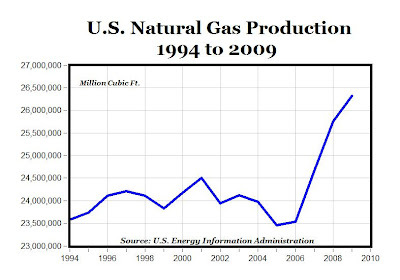 Total U.S. proved reserves of dry natural gas rose by 6.9 trillion cubic feet (Tcf) from 2007 to 2008. That increase was on top of production of 20.5 Tcf (see Figure 1) and reflects another strong year of net proved reserve additions of natural gas in the United States. Figure 2 shows that natural gas proved reserves are now at their highest level since EIA began reporting them in 1977. In 2008, dry natural gas proved reserves attributable to shale reservoirs grew dramatically, up 51 percent to a total of 32.8 Tcf, or 13 percent of total proved reserves of dry natural gas (Table 2). Of this, 8.9 Tcf was from discoveries and 4.2 Tcf was from upward revisions and other adjustments. In contrast to natural gas, reported crude oil proved reserves declined by more than 10 percent to 19.1 billion barrels, despite a third year of increased discoveries (Figure 3). The EIA has been mostly wrong about oil and gas for the past decade. Why should we expect them to be right this time? As I said, we have plenty of data that allows us to think for ourselves. All we need is to look at the information carefully and try to connect the dots in ways that the EIA has refused to. Please note that the EIA and IEA had plenty of time to look at the depletion rates but refused to do so until the massive amount of new investment failed to solve the supply side problems and prices rose to over $100. It was only after reality hit them in the face that the agencies and consultants started to look at the field data and concluded that their depletion estimates were off by more than 50%. We can't talk about gas production at this time without looking at the depletion from conventional sources, coal bed methane trends, and the economics of shale. And if you have paid attention to the conference calls you would have learned that Chesapeake and other companies were basing their E&P budgets and earnings projections on the assumption of a NYMEX natural gas price of around $7.25 per MMBtu. That makes most of the wells uneconomical and there is little incentive to spend much on drilling. Given the 70% decline in production over the first year, production will not be going up as we were told. That means that any uptick of economic activity that increases demand will likely cause significant price increases. Of course, given the terrible state of the real economy I doubt that demand will increase by much and expect a further decline at some point. That could mean even lower prices and less incentive for producers to invest in domestic drilling. There is an element of truth in everything you say, but you seem to end up with a somewhat distorted picture in the totality. Economics gives us a nice tool to think about what has happened to the domestic gas market. It's called a "supply curve". The application horizontal drilling/fracking to the shale plays has added a very long plateau to the gas supply curve in the $5 or 6 per mcf price range. Does this mean sweetness and light always and everywhere? No, but it's better than not having this large increment of available supply at all. So, while this may not be the energy panacaea, it is certainly a very significant development that is already paying large dividends to the US energy consumer and will continue to do so for decades to come. My debate is not with the fact that $12 gas got people excited and led to methods that allowed the energy companies to consider shale production. It is with the idea of peak gas production, which I claim is quite near unless prices rise substantially. Economics cannot help us offset geological factors. To make up for falling production from existing conventional fields you need to find new conventional sources that can be developed at reasonable prices or new unconventional sources that make economic sense AND can produce enough gas to keep production increasing. I claim that much of the increased production did not come just from shale but from coal bed methane production, which is now in decline. I also pointed out that if you look at the actual data provided by the energy companies you see that the incentive to produce more comes at prices that are above $7-$8, which makes our current level a negative. While companies will sink a few wells to keep their leases valid, they will spend as little as possible until prices go up again. Given the 70% decline over the first year and the low rates after the fifth year of operation, I see no major positive in the data. Keep in mind that the production of light sweet petroleum peaked in 2005 and did not rise even though the sector attracted hundreds of billions in new investment. Also keep in mind that barrels are not equivalent and to get the same amount of end product production (which is what we use) you need more than one barrel of unconventional oil for each barrel of light sweet that is lost. I think that you misunderstood me. I invest in the energy sector and have a huge amount of my capital sunk in profitable unconventional production. But as someone who has looked at the data, I am under no illusion that some of my unconventional holdings will be spending the money necessary to offset depletion unless prices go up. If you pay close attention to the data and what is actually said at the conference calls rather than what appears to have been said, you will find that things are more dire than the optimists are suggesting. What we need is real action to ensure that we can make it through the transition as painlessly as possible. But that action is unlikely to take place until after the EIA and the optimists are exposed as little more than cheerleaders. I am an energy project investor, so I have a pretty good sense of the economics. While you are correct that many of the claims being made about the shales are at this point uncertain, this is indeed a huge new source of supply. The reason we are not seeing CBM plays get drilled much anymore is not that they no longer exist, it's that they are (or at least currently appear to be) further to the right on the supply curve than the shales. While I think producers may be overhyping the shales (i.e., full cycle costs may end up being more like $5 or 6 than $3 or $4 per mcf; sweet spots may not be as big as claimed) there is little doubt there is a lot of new resource available. One thing I am certain of is that prices *will* be high enough to keep us drilling in the lowest cost supply basins. If the shales need $5 or 6 gas to be economic, we will have $5 or 6 gas. If they only need $4 gas, we will have $4 gas. If the shales need $8 or 9 gas, we may end up tapping CBM or LNG first instead. And then get to the shales when the better CMB or LNG plays deplete and prices go up/costs come down enough to justify tapping the shales. This all gets to the shape of the supply curve. Which becomes known over time. In any case, at the current moment, the widespread perception is that the shales are a huge resource and are economically positioned to be the main source of marginal supply for the foreseeable future. This would not have been the case in, say, 2002. At that time we would have said Rockies gas/LNG imports would fill the growth wedge. Before that it was deepwater GoM, and before that it was tight sands, and before that it was western Canadian imports, etc, etc. I agree that there was a great deal of drilling that was justified by the high price of natural gas that has brought on new supply. But as I pointed out, the industry data shows massive depletion over the first year. That means that we need continued new drilling activity just to keep the supply from falling. But the incentive to drill new wells isn't there at $4.75 gas. While some of the early wells will do fine because their production was sold forward at a high price in the futures market, that option is no longer there for producers. I believe that will mean that implies much lower activity with producers doing the minimum to comply with the lease conditions. That is my point. The easy natural gas from CBM is now gone and production is heading south in a hurry. The costs have been running on the high side so far even after the improvements. That means that the incentive to spend much on drilling isn't there at the current market conditions. I don't think that we will have much drilling at $4 even if costs come down to $4. There is too much incentive for producers to keep as much in inventory as possible, particularly when shareholders are finally getting some understanding of the depletion issue. I agree. But we already have some data and that is not as positive as the naive optimists believe. This is an old story. There has always been someone telling us about the abundant amount of oil and gas in the American shale formations. In Ayn Rand's book Atlas Shrugged we had Ellis Wyatt, the entrepreneur who figured out a way to get oil out of shale. Ever since I began looking at investments there was always a story about some process or another that would make shale a source of abundant oil. None of the promises panned out. While I am much more positive about horizontal drilling, I still don't see the great returns that the optimists expect. That comes from a guy who made a small fortune from oil production in Kazakhstan as he watched promises of new regional production projects fail time after time. All production depletes. Shales deplete faste. In some wyas this is good. For a given BCF/well you get your shale gas faster. Anyway, the expected decline curve is priced into the well economics. When we say "this well is economic at $5" we are factiring in the expected production curve. The thing about the shale formations is they are (relatively speaking) "blanket" formations. You can "manufacture" gas from them. You just lay out a grid formation and drill a well every 40 acres. In the old days, you had to locate structures, etc. With shales you don't get dry holes. Wwhen the price is high enough, it's like printing money. That means that we need continued new drilling activity just to keep the supply from falling. But the incentive to drill new wells isn't there at $4.75 gas. While some of the early wells will do fine because their production was sold forward at a high price in the futures market, that option is no longer there for producers. Where you are right: if the price is not high enough production will decline. Whaere you are wrong: This means the price will be high enough. If gas production declines, and shortages ensue people will pay more for gas. Once prices are high enough we can drill the crap out of more shales. Hedging doesn't make you drill wells. If you have nymex contracts at above market prices are better off cashing them out than drilling sub-economic wells. Nope, there is plenty of CBM that is simply not getting drilled right now because shales are better (actually, because prices are lower technically). The exact same CBM wells sitting in the exact same CBM fields as were getting drilled 2 or 3 years ago. They just stopped their programs. Ready to drill. Again, if producers won't drill at $4, price won't be $4. Decline will set in, price will go up. Well, I can't be responsible for what naive optimists believe. I can tell you more or less what I already have. The shales are a huge new plateau on the natural gas supply curve, if I had to guess at around $5 or $6. They will be the marginal source of supply to the market for many years to come. Fail to see the relevance of "what someone has always been saying". I assure you people are out there drilling these wells and gas in coming out of them. The Barnett shale has already made a few billionaires. The Haynesville, Fayetteville and Woodford are well established. The Eagle Ford and Marcellus are growing dramatically as we speak. The Horn River has hit some big wells. Then there are 5 or 6 others getting attention as well. Mancos, Chattanooga, Utica, Antrim. Not even counting the Bakken, which is oil. We don't know how big this is going to be, but it's going to be big. The general projections I see are 5+ Bcfd for Haynesville and 5-10 Bcfd for Marcellus. I think Barnett is already doing 5 Bcfd. To put this in perspective, the Alaska gas pipeline (likely postponed indefinitely due to shale growth) is a 2 Bcfd project. All production depletes. Shales deplete faste. In some wyas this is good. For a given BCF/well you get your shale gas faster. Anyway, the expected decline curve is priced into the well economics. When we say "this well is economic at $5" we are factiring in the expected production curve. The thing about the shale formations is they are (relatively speaking) "blanket" formations. You can "manufacture" gas from them. You just lay out a grid formation and drill a well every 40 acres. In the old days, you had to locate structures, etc. With shales you don't get dry holes. When the price is high enough, it's like printing money. As I have argued before, we can make a decent living drilling shale oil and gas wells at particular points in time. But what may be good for us individually does not mean that there is solution for our supply problem because there is no way to get enough oil and gas from shale to offset that depletion. You are assuming that when prices of oil and gas rise, the price of inputs required to produce more oil and gas will remain sufficiently low to ensure high margins and justify new drilling activity. But that may not be right. When we saw the price of oil explode from the $30s to over $100 the price of drilling services, geologists, data services, etc., exploded in a similar fashion. The profits did not come from the new drilling activities and production but from the existing production that had been paid for at much lower levels. Producers use hedging to offset risk. They have no problem with selling production from a given well forward to finance drilling activity that would result in a predetermined return. When prices are low they won't drill new wells and take a loss. This is not true. Many of the CBM areas have already been developed and are now in decline. No new drilling will reverse that decline just as new drilling will not offset decline in conventional oil and gas production areas. CBM decline rates come to about 45% per year, which means that a huge amount of drilling activity is needed just to keep production flat. But if you look at the Rigzone and Baker Hughes data you will find that the rig count is lower today than it was in 2008. The shales are a huge new plateau on the natural gas supply curve, if I had to guess at around $5 or $6. They will be the marginal source of supply to the market for many years to come. Shale production is OK at the margin but the data shows that it is not enough to offset depletion.